Our local chef celeb Michael Symon gets a lot of airtime and although I personally question his sanity about things like the best coney in Detroit (clearly Lafayettes) and his beliefs about the desirability of Barberton chicken in general, I have found many of his recommendations addictive. One of those is certainly the jerky from Czuchraj Meats at Cleveland’s West Side Market. 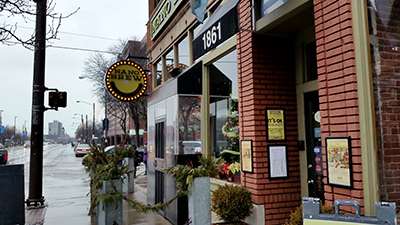 Every now and again I’ll get a hankerin’ and we’ll find ourselves in Ohio City. This time it wasn’t me…the stuff is contagious…Steph needs jerky. Before rubbing against piles and piles of Saturday strangers for jerky we stopped at another of the multitude of little spots in the area, Nano Brew. Now, I am not a hipster, don’t care too much for the whole concept, but you can often find interesting vittles where they congregate. The staff at Nano feels very hipish but comes without the sideways glances and snotiness we see on occasion. They come across fun and friendly, making many visits to the tables, brewing the house options and tending the bar. The interior is gussied up raw industrial with more space than you would expect. 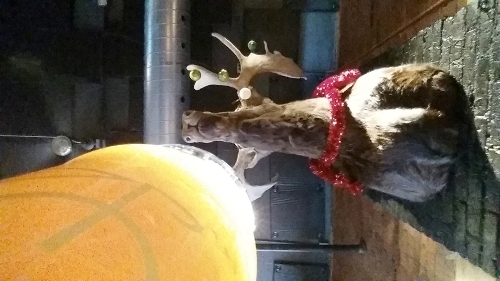 There’s a bike (cycle) theme with little odd bits thrown in including the moose we are dining beneath. I ordered their Amber ale. They call it the Nano Namber Ale and insert some levity into the menu across the board from the drug references to the Alabama steak sandwich (Bologna, yellow mustard, American cheese, white onion on Texas toast). The beer is solid, hoppy and toasty, not bad at all. We had some trouble deciding on our lunch. 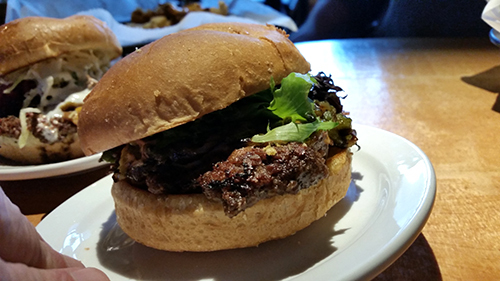 The chicken and biscuits were going to happen but they have two burgers, which have gotten some attention. Two. One was named one of the 33 best burgers in the country by Thrillest and the other the most unique in Cleveland by Cleveland Magazine. Of course, we got both. 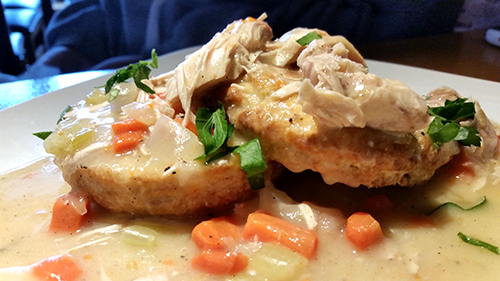 The country style chicken gravy and the buttermilk biscuit were fine. 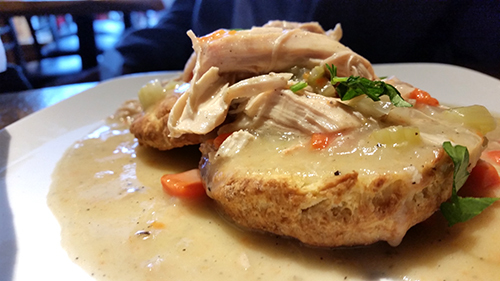 The biscuit would have benefited from some flakiness and the gravy from some depth and salt, but a passable dish regardless. The burgers were a split for me. Both patties needed seasoning but came with a wonderful crust from the grill. Both would depend on the toppings to make them something to remember. The “Spicy” (33 best burgers in America) with Cheddar cheese, poblano pepper, onions, spicy mayo and greens call the Thrillist list into question. Not really spicy (Steph found it plenty spicy) and muddled, it didn’t really make for much of a burger or any other kinda sammitch. The Acid Trip was better, but even in just Cleveland (in my fat bellied opinion) there are better AND more unique burgers than either of these two. 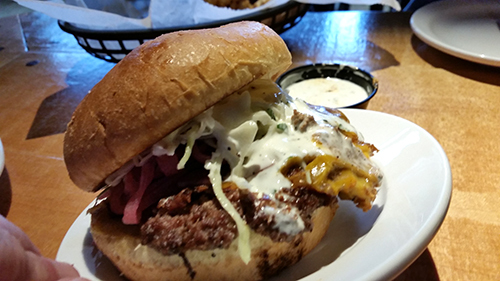 The Acid Trip comes with Cheddar cheese, pickled onions, slaw, a balsamic reduction, and a spicy mayo. 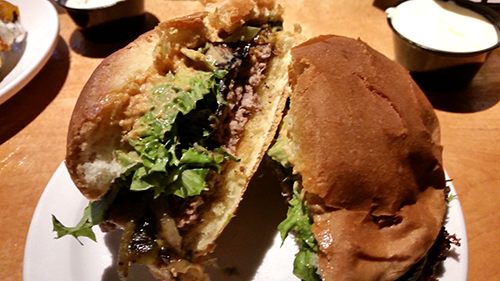 The mayo lent every bit as much spice as appeared in the “Spicy” burger, the sweet and sharp from the vinegar and pickle cut through everything else. 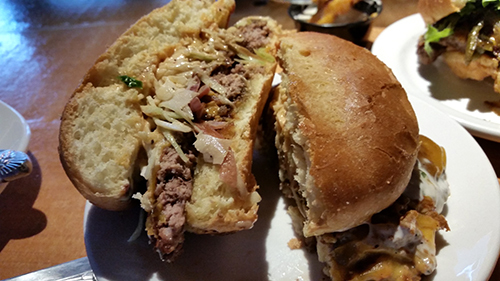 Add a little creaminess from the slaw and you have a better than average burger. Where Nano Brew really made a mark for me were the taters. Alongside both burgers, we upped the tuber to an order of brewery chips and stoner fries. 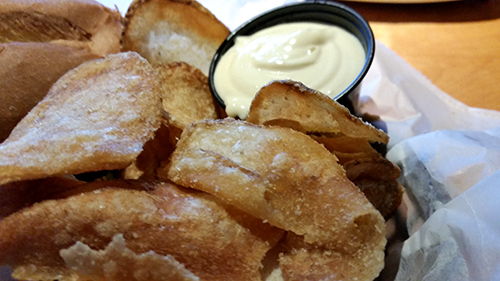 The chips are thin and crispy, sure…but then toss them with brewers yeast for a lightly bready awesomeness. They are served with a malt vinegar mayo, which is way more mayo than malt. I’m hoping someone poorly mixed, since the mayo was too much on its own and the malt may have made for a spectacular combo. The chips were tasty enough without. Then came the mind blowing Stoner Fries. The appropriately named combination of late night ingredients were so good together, you don’t need weed to enjoy. 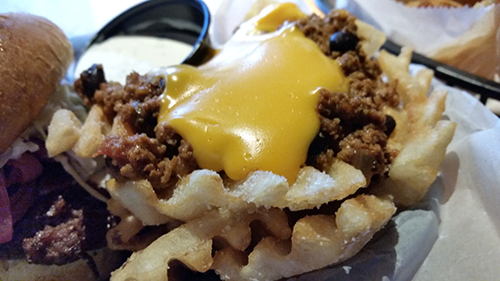 Waffle fries, chicken chorizo and black bean chili, cheese sauce, green onions, and ranch dressing make complicated magic. The fries, chili and cheese were delicious alone but in this sick and twisted universe, a dip of ranch dressing resulted in one of my favorite tater preps of a long, long time. Waffle crack, for stoners. I’m in. There are more interesting options at Nano Brew and the next time we are on a jerky hunt, it would be interesting to see what else you can order with the Stoner Fries.